Welcome to Day 14, if you are just arriving for the first time all the details and the linkup can be found HERE! We have passed the halfway point! Don't forget all the ways you can get chances to win some awesome prizes donated by my generous sponsors! ALSO--the 2017 - 25 Days of Christmas Tags Pinterest board is updated daily, we are already at 132 pins! Excited to share that Concord & 9th is my guest today! Two lucky people have a chance to win a $25 gift certificate! Both the Design Team at Concord & 9th and Where Creativity Meets C9 are joining in today with more Christmas tag inspiration! Mixing ideas today... Hope that's allowed! Inspired by the bauble idea... but with a wreath in it! The paper pieced tags are lovely, as is the felt ornament tag. Michele's gold and white ornament tag is stunning, and I love the colours on the last wreath tag. I enjoyed looking at everyone's tags with C9 product. It is going to be hard selecting which tag inspires me because ALL of them do!!! ;) Thanks for another fun day. GORGEOUS! LOVING that stitched ornament!!!!!!!!! Oh Tracey, I just love your wreath tag!! What a gorgeous set that's now on my wish list! Oh, my... lovely tags ladies. The felt ornament is so pretty! I am in love with it. Tracey, your wreath shaped tag is gorgeous! I really like the heat embossed leaf wreath over the green leaves and the bells. Great design! Such a variety of beautiful tags form everyone! I love your wreath laden with gold Tracey, and that petite belt is the perfect touch! Fun tags, love the colorful inlaid flower. Beautiful tags! I love their simplicity! I'm very inspired by Lisa's tag and from yours, Tracey. I love the use of felt and I'm totally in love for your stunning wreath and the colouring!!! I love The ornament tags! Yay! Love Concord & 9th. And swooning over these particular tags this morning! Holiday perfection! I really like the unique products from Concord & 9th. 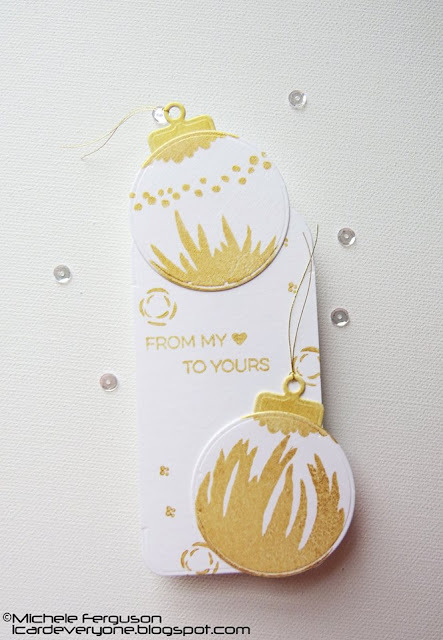 The shaped ornament tag with the pretty cut-outs is very beautiful! AWESOME TAGS! I especially love Michelle's gold ornaments tag! FABULOUS tags by the Concord & 9th team! Love the ornamental die set. Love C&9--wonderful products shown here! 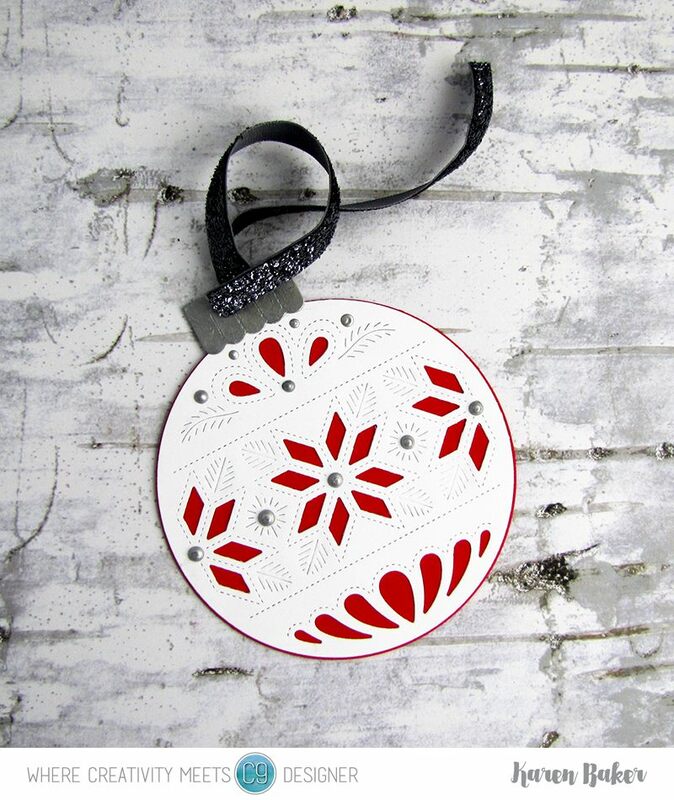 Your tag is gorgeous, Tracey & I love the red & white ornament! 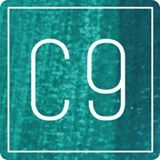 I love all things C&9! Again with the buffalo plaid! I love your wreath, too! Wow! Another inspiring day of tags - love the Happy Holidays Wreath. 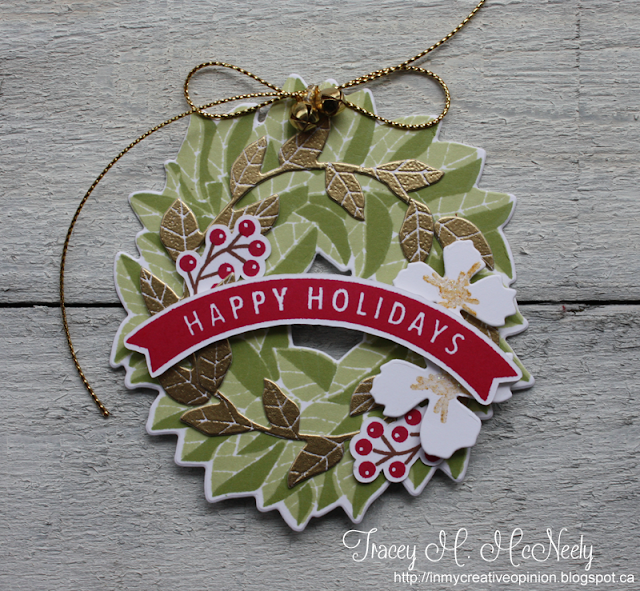 Another day of wonderful tags - love, love, love the Happy Holidays wreath. 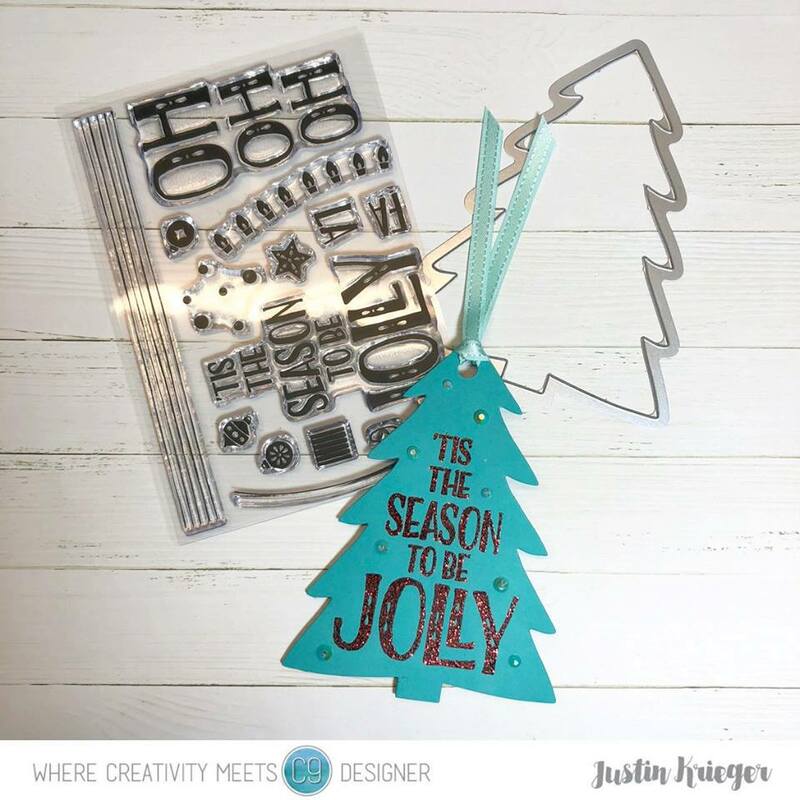 I absolutely am inspired by Justin's Christmas tree shaped tag. I would like to recreate that. I am in love with the Concord and 9th style!!! I absolutely love these tags! Especially all that gold being added in. Beautiful!! Oooo...I love your wreath, Tracey. I'm already inspired to give that a try, as well as Lisa's felt ornament. Back to my craft room. Thanks for even more fabulous inspiration. Beautiful tags! Thanks for sharing them. 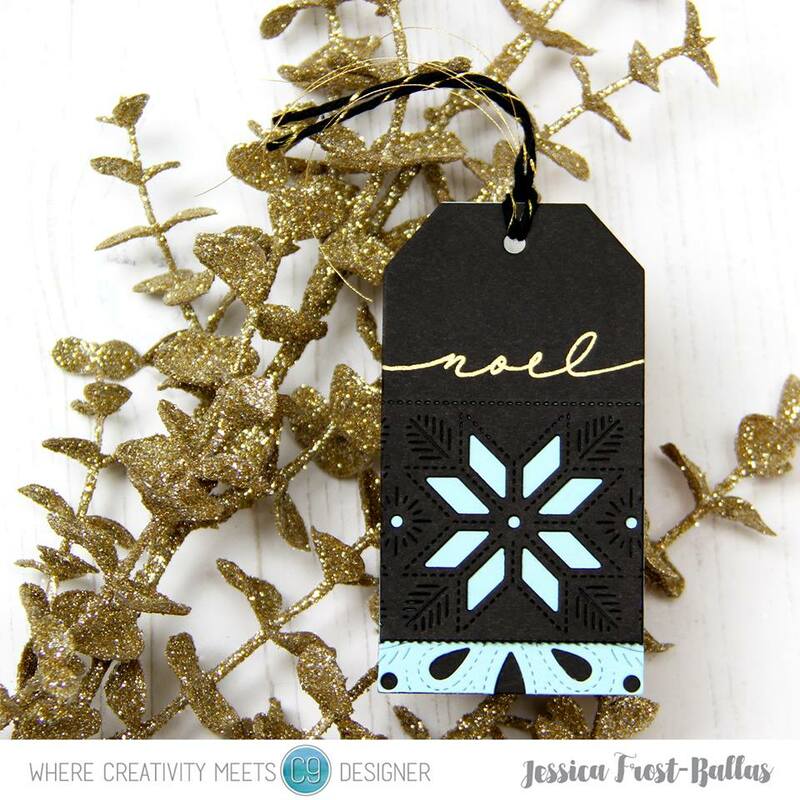 Today's inspiration comes especially from Michele Ferguson's white and gold tag. So beautiful! That design would work well with just about any single color too. Fabulous tags! Lisa has inspired me to pull out some felt! i love Concord &9th! They have definitely carved their own niche in the stamping world. The stitched ornament is beautiful. Great tags today! They are all so unique and different. Great job! What a fun and sweet post with tons of craftiness! Loving these gorgeous tags, all are so inspiring! I love the wreath tag Tracey and the ornaments with the cut outs, so pretty with some simple die cutting. So many cute tags here! I adore wreath nad felt tag. So many ideas and styles today with all of these wonderful designers! I love Justin's idea of using the tree for the tag! Another great collection of tags. My favorite is the wreath!! So many fabulous tags! Love the felt one and Lindsey's creative 'HO, HO, HO! Tracey, your wreath is absolutely stunning! Tracey, your wreath tag is absolutely gorgeous!!! 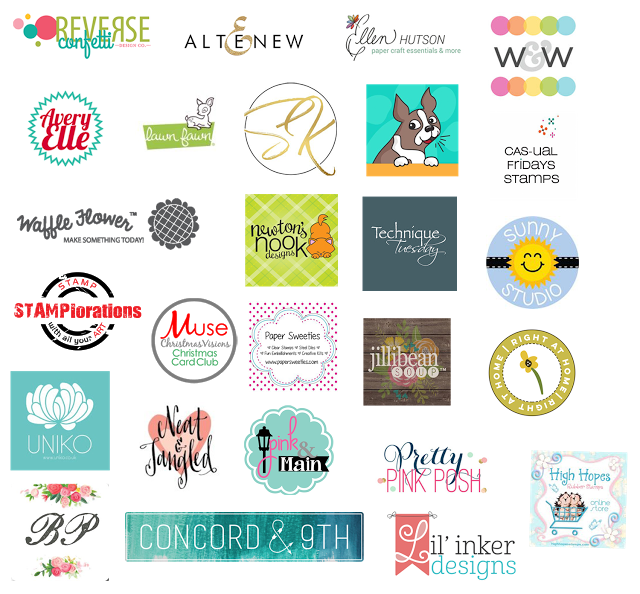 I'm loving all of the Concord & 9th products featured on today's tags!!! So amazing! So thankful for this creative team! Their tags are so inspiring, and I cannot wait to CASE them. Your wreath tag is beautiful...I'm still trying to figure out how you are getting all of this done Tracey. I've said it before and I'll say it again - you are wonder woman! Such a cute idea to use felt! Wow! So many beautiful tags! I love yours!! 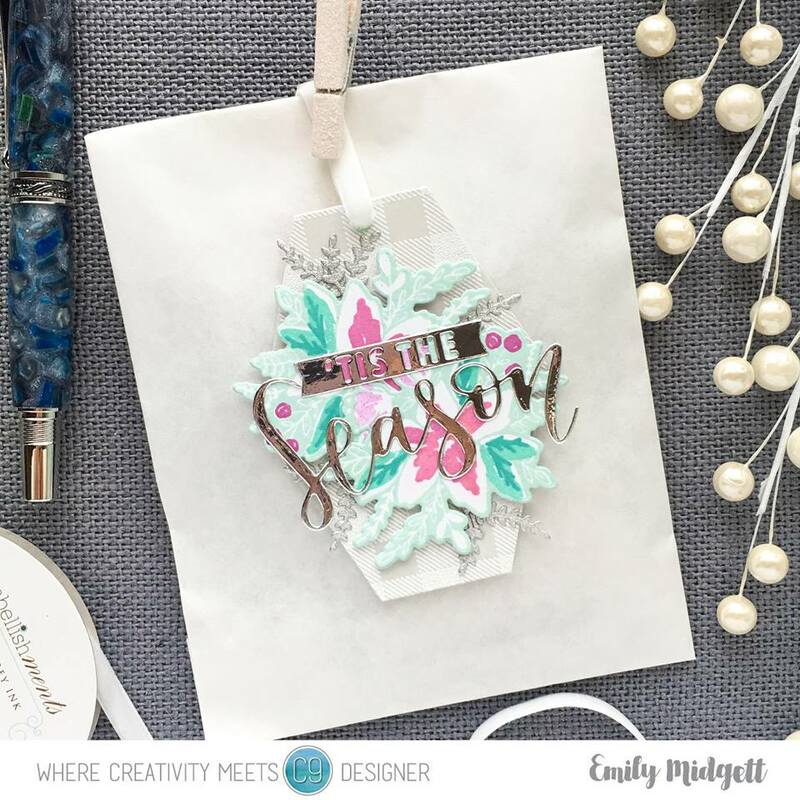 Beautiful wreath tag! Great tags. My fave is your wreath tag. 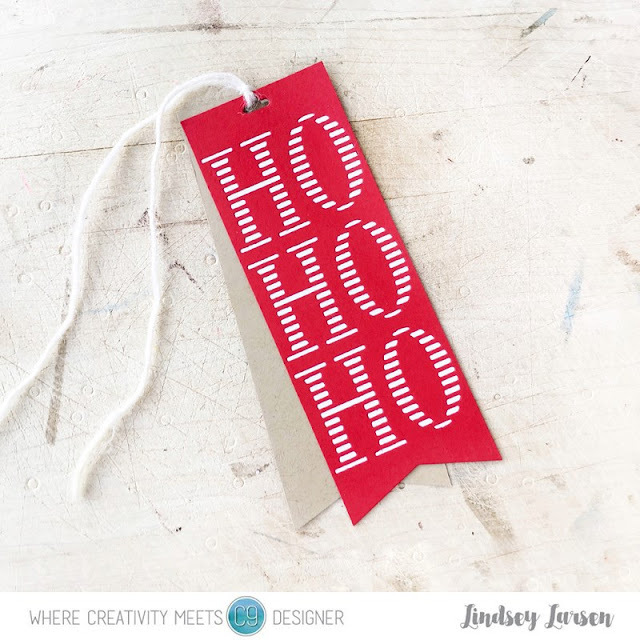 The simple, graphic tags are really appealing to me today -- the bold ho ho ho, and the bright teal tree. Nice selection of styles here. It's so impressive to continue to see wonderful creativity and inspiration each day! I think my favs are the pink, teal and silver tag and your wreath tag, Tracey, but all of them are beautiful. 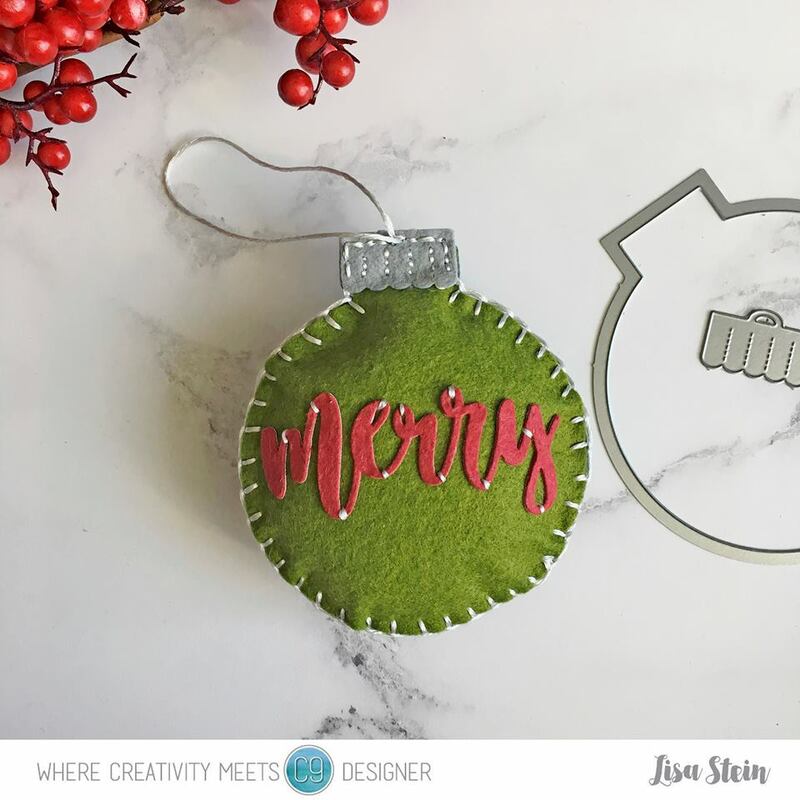 Tracey, your wreath tag is stunning! Love it! It is just so fun to see all the different tags! I love them all. 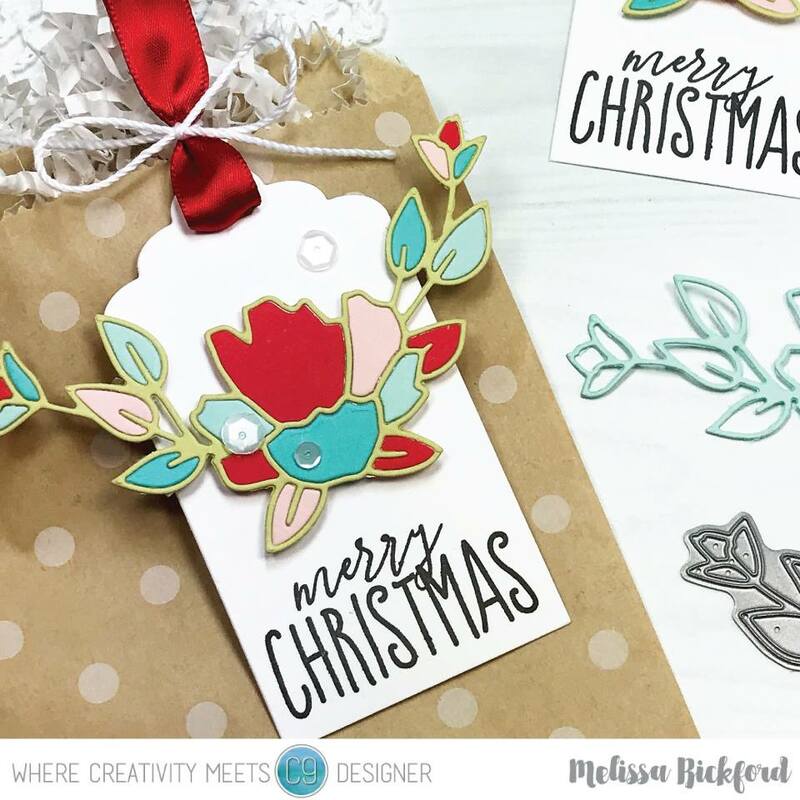 Love your gorgeous wreath tag Tracey with such fab inspirations too! Love Concord & 9th! Your wreath tag is so pretty! Great Tag day! I really love that wreath! And the felt tag must be tried! Concord & 9th really knocked it out of the park with their Christmas sets this year!!!! 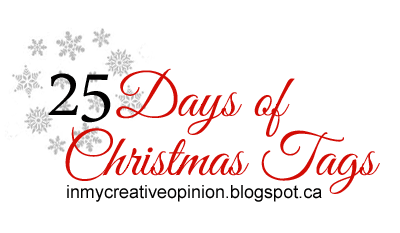 Tracey, I love that you made the Magnolia Wreath into a tag!!! Loving the first set of tags with the CAS design and black and white color combo! 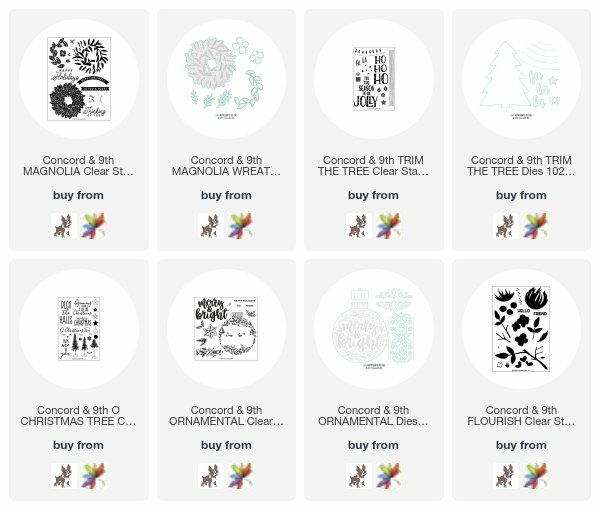 I'm loving all the Christmas stamps from Concord and 9th this year. A bevy of beautiful tags! Now I want allllll the C9 products featured here! No favourites; just love the entire assortment! Who would have thought black would make such great tags. All of them are very creative and I'm trying to decide which of my C9 products to use for mine. I love the Nordic embossing and the amazing layered tags! So pretty today! Love the black! Your wreath tag is beautiful. These are so lovely. I am inspired by the shaped ornaments as I just received my Hero Arts monthly kit and it is making ornament shaped tags! Thanks for the ideas. I love your tag tracey, and the others tag too! from Karen Baker love the classic color and beautiful ribbon too...I love the black and blue from Jessica too so adorable look..
Just adorable tags. All are amazing but my favorite has to be the wreath! Thanks for sharing all the inspiration. Great looking tags. My favorite has to be the wreath. Thanks for the inspiration! Wow - my head is swimming with ideas! You’ve combined these various products to create so many different looks. Love your tag ideas! And as always, Tracey you're closing the march with a wonderful tag !! Love your tags, especially the felt one. I love C&9th so everyone's projects are inspiring! Love your wreath tag Tracey! The felted tag/ornament is absolutely amazing!! So many beautiful creations! I love the tags, especially the Christmas tree tag. Your little wreath tag is so pretty, Tracey. Another great day of tags. 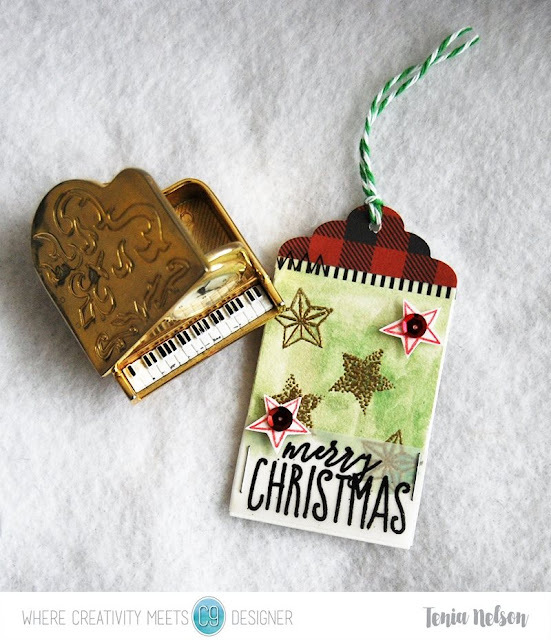 I enjoyed seeing a few here using everyday stamp sets to create holiday tags. So many pretty tag ideas! The wreath is gorgeous! Tracey I just love your wreath tag. It's so elegant and I LOVE the little white flowers on it. Your tag inspired my day 14 tag. I had so much fun making it. Also, I have had so much fun participating in this event. I don't think I have created this much in years. I keep posting on my blog that there is so much creativity going on over here that you can't help but be inspired. And the products!! WOW!! Thanks so much for hosting this event! My C9 stamps are some of my favorite ...Love this company. They're all so cute today! I love Concord and 9th! I decided that Melissa Bickford's color combination was just too fantastic to not use, so that is where my inspiration came from! and pick favorites-I love them all! 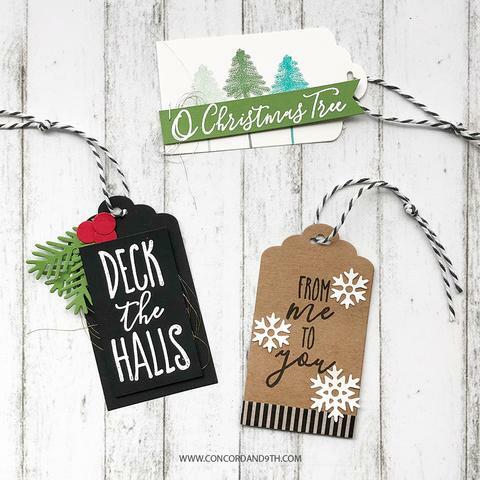 I adore Concord & 9ths CAS kraft tag with the white snowflakes...so simple and yet so impactful! Love the bold black and design on Jessica’s tag. I’m truly inspired to try something very similar. Loved many of today’s tags. Thanks for sharing ladies! love the felt one ! Love all these fab tags. I used Melissa's die based tag as my inspiration. Oh man I love this gorgeous wreath tag! I now want that set lol! HO, HO, HO! And the Jolly Christmas tree! I love those two tags so very much. I wish I had a HO HO HO that size...maybe it's time to shop. Gorgeous tags! I love the fresh designs that Concord and 9th always comes up with. Love Lisa's felt tag. Lovely idea that can be preserved as a keepsake. I can’t believe every day is a wonderful as all the days before. So much creative talent and beauty! I have a few favorites: Jessica F, Karen B,, Melissa B., Michelle F. (Love this! ), and Tracey M. Thank you so much for all the inspiration! Tough decision but ultimately Lindsey's red and white won out. 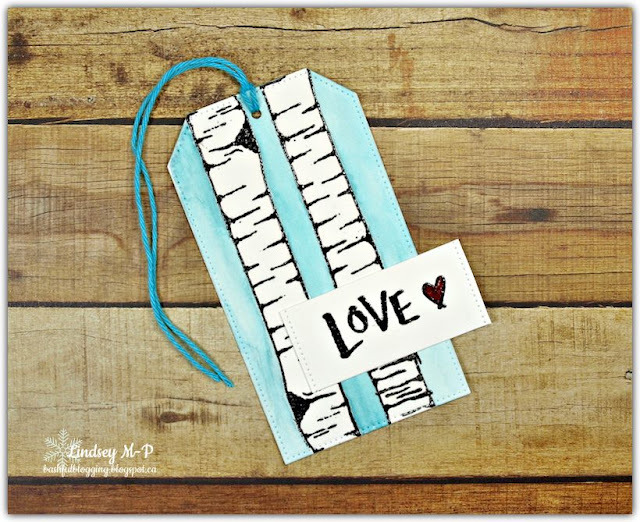 so special and beautiful tags!